Fearing eternal ‘single-dom’, childhood friends Kate and Paul make the age-old vow that if they don't find love by thirty, they will marry each other. Years later, with the deadline of their 30th birthdays approaching, the unlikely couple decide to keep their teenage promise. After all, they are such good friends. Surely that's enough to make a marriage? Now, on the eve of their 10th wedding anniversary, they will discover that love between men and women is more complex, and more precarious, than they could have ever imagined. 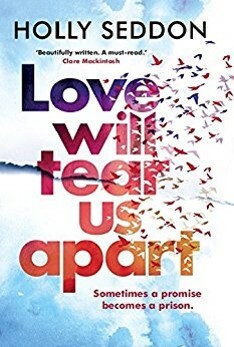 It seems that Kate struggles with a secret that reaches far into their past; but will the couple's vow become the very thing that threatens their future? The first thing to be said about this book is that it’s not a crime novel per se, neither is it a psychological thriller. It’s a study of a relationship. The book spans two timelines: Kate and Paul go away for a week with their children, as a means of celebrating their joint fortieth birthdays and their tenth wedding anniversary. Told from Kate’s point of view, she makes reference to a letter she’s found that hints at a ticking time bomb. Interspersed with the events of the week is the story of their friendship: how they met as eight-year-olds, and become best friends. They develop a bond that goes beyond the boundaries of physical attraction, or even siblings, eventually becoming man and wife because of a promise they make to each other as teenagers. As the study of a relationship it is very well delineated. Kate and Paul are somewhat flawed characters, each with inner demons and not particularly likeable at the start. But the more we find out about each of them and the demons they’re wrestling, the more sympathetic they become. It’s a well-written character study with some genuinely touching moments. However, anyone who likes books with rising body counts, thrilling chases or a slow burn culminating in a dramatic explosion might be a bit disappointed, as this book is none of these things. The reveal of the contents of the letter is dragged out a bit, and when it comes I found it rather less explosive than I had been anticipating. Still, the writing is flawless and anyone who likes books with realistic characters dealing with contemporary problems will find much to like in this latest from Holly Seddon.